Are there any special operational requirements for operating the system in estuaries or creeks? Yes there are. In brackish water, the output of the membrane will increase. While this can be good, if the output increases too much, it can damage the reverse osmosis membrane. Decreasing the operating pressure to a lower level will ensure the product water flow rate stays the same as in a full marine environment, thus protecting the RO membranes. Ensure the product water flow rate does not exceed recommendations. Also, estuary or creek water typically contains more sediment, so keep close attention to the pre-filter, changing when necessary. Can I buy a pressure supply unit individually if I already have RO membranes? Yes. The pressure supply unit uses an ST series 1/4" quick fit socket. The corresponding plug adapter is readily available and can be fitted to your own high pressure hoses. See our products page for more details. Does it matter whether I purchase my Rainman unit direct from Rainman Technology versus through an authorised dealer? A dealer will be able to offer more personalised service and the same competitive pricing. If you don't have a dealer in your area, we are happy to provide service and ship product remotely. How does desalinated water taste? Desalinated water tastes somewhat similar to distilled water. Some people choose to add some minerals back in to their tank to make it taste more like tap water. Other people report that the crystal clear ice cubes it makes looks great in their gin and tonic. How easy are in-field repairs if they become necessary? Our objective is to keep the system non-proprietary, so we used common industry parts and fittings for the system design wherever possible. All the key components are readily available from within the pressure supply unit using typical spanners (wrenches) and other tools one would expect to be in a common tool bag. Although we recommend servicing by qualified technicians, owners with mechanical aptitude should not have a problem maintaining the unit. How easy is the system to operate? Very simple. You bring the pressure supply unit and RO membrane case on deck and attach the high pressure hose between them. Put the take-up and brine discharge hoses in to the sea and the fresh product water hose in to your tank. Start the electric or petrol motor and close the valve on the RO unit until pressure hits about 55 bar (800 psi). You will now be making fresh water. See the quick reference card or operations manual for more complete details (example documents for petrol/gasoline version). How long will a Rainman system last? With proper care and maintenance, a Rainman desalination system is designed to last over ten years for average pleasure craft use. Usage and maintenance patterns will obviously affect longevity. How long will one tank of fuel in the engine last? A full 0.77 litre tank on our system will operate for approximately 70 minutes, depending on the fuel quality. The amount of water made in this time will depend upon which RO membrane configuration you have and water temperatures. Warmer tropical water will lead higher output, while cooler water will yield less. To see expected output range for various RO membrane configurations, please see our products page. How pure is the product water? Desalinated water has less than 500 parts per million of salt. In addition, reverse osmosis eliminates just about all other impurities, including metals, viruses, bacteria, giardia and crypto. Read the desalination theory page page for more detail. How reliable is a Rainman portable watermaker? Our system is built to last. We use a Honda engine, General Pump stainless steel high pressure pump, Dow Filmtec membranes, and miscellaneous fittings are 316 stainless steel. You should get many years of service out of our systems. As with any critical life supporting system, we recommend redundancy. It is prudent to carry extra bottles of drinking water as a precaution. The beauty of this system is that no installation process is required. You can choose to install it if you wish, or keep it as a portable appliance. More information on the pros and cons of installation. Many watermakers have two pre-filters, why does Rainman only have one? Many watermakers have a 20 micron followed by a 5 micron pre-filter. They are typically installed below deck and in difficult to reach areas, so changing filters is a cumbersome and messy task. Rainman is often run on deck and is more easily inspected and accessed. This makes changing filters very easy, so we decided to keep the system more portable and go with a single 5 micron pre-filter. We can make custom modification to include dual pre-filters upon request. What about an energy recovery pump to make operation more efficient? What are the advantages of Rainman over other types of watermakers? What care is required for my Rainman system? Apart from pickling the RO membrane when necessary and changing the pre-filter when dirty, we recommend changing the oil in the pump and motor after the first 10 hours of use and every 50 hours of use thereafter. What consumables should I keep on hand for the system? With proper care, your Rainman desalination system will last for years. It is advisable to keep spare pre-filter cartridges and pickling concentrate on hand. The Jabsco lift pump has a rubber impeller blade that will require changing every few years, depending on use. While the belt is designed to last for years, some people will have a preference to keep a spare for extended cruising. See our consumables & spares page for more details. Obviously the petrol pressure supply unit will require fuel as well. What does “pickling” the membrane mean, and how is it performed? "Pickling" the membranes is a necessary process used to protect your RO membranes when unused for a period of time. Rainman is the simplest system on the market to pickle because the pickup hose can be placed in a bucket of pickle solution. In built systems require a complex three way valve system. See our owners manual for details on how to perform the pickling. What electrical components exist in a Rainman system? With the goal of design simplicity, we wanted to eliminate as many components that don't enjoy a saline environment as possible. Our petrol desalination system is a purely mechanical device without any electrics other than the spark plug and kill switch. The electric version has only the 1.1kw fully sealed induction motor and on/off switch. We have no electronics or software in our desalinators. What factors affect the output levels of reverse osmosis? The size and number of the RO membranes have primary influence on system output. For example, a 40" RO membrane will make almsot twice as much as a 21" membrane for a given operating pressure and flow rate. The other major factor is water temperature. Warm tropical water will make the RO process significantly more productive than cooler temperate waters. Water temperature variation is the largest influence on the range of output levels for each given RO membrane option. For those that might be in an estuary or creek, salinity levels will impact output as well. Lower salinity will lead to higher output. See the question on operating in decreased salinity environments for more info on estuary and creek operation. What is the sound level of the system while it’s running? The petrol (gasoline) system is slightly queieter than a Honda 2kVA generator running at maximum load. 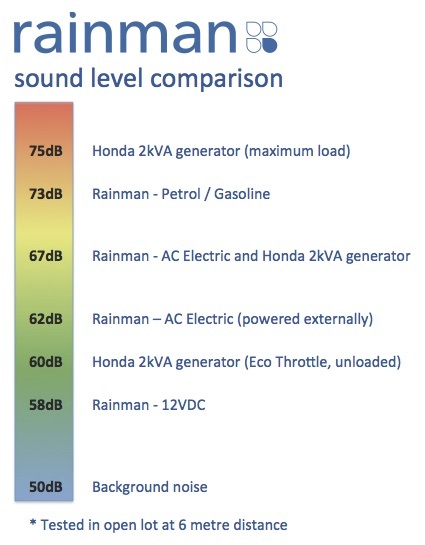 Our AC systems make a loud hum, while our 12VDC systems make a quiet hum. What is the warranty of my system? Rainman desalinators come with a two year return to base warranty against manufacturing defect. The Honda motor in the petrol pressure supply unit is covered by a three year Honda warranty. As we are a Honda OEM, you can bring your Honda motor in for service to any Honda dealer globally. What spare parts are recommended to keep on hand for self sufficiency? For most owners, pre-filter cartridges and pickling concentrate are the only consumables required in addition to the occasional oil change for the high pressure pump and petrol motor. For extensive long term cruising, some owners may wish to take a spare lift pump impeller blade, drive belt, spark plug, RO membrane, and high pressure hose for emergency repairs. What storage requirements exist for the system? The pressure supply unit should be stored as near to upright as possible to keep the engine properly oriented. The RO membrane case can be stored in any orientation, but the temperature should be between 5°C (40°F) and 35°C (95°F). Note that if the membranes are not pickled, cooler temperatures will allow longer storage before bacteria begins growing. Do not allow the membranes to freeze. Where can I get an operations manual for my system? A printed manual and a laminated quick reference card will be delivered with your Rainman desalination system. You can also download the appropriate pdf of the operations manual and quick reference card from our downloads page. Why are there fewer valves and gauges than other systems I’ve seen? Rainman Desalination set out designing the system to be as simple as possible, without unnecessary bells and whistles. While many measurements may be somewhat interesting, the only necessary gauge is pressure at the RO membrane and the only necessary valves are one for controlling that pressure and another relief valve for safety. Why is the self-contained pressure supply unit powered by petrol instead of diesel? Desalination is an energy intensive process and a petrol engine gives the highest power to weight ratio. A diesel engine of the required power would be much too heavy to be designed in to a portable system. Why is there an air bubble in my pressure gauge? Liquid filled gauges are the highest quality and most durable ones available. The air bubble is part of design, and exists to allow the glycerine fluid to expand and contract as the temperature fluctuates. The purpose of the glycerine fluid is to dampen needle movement.